In 2010 the Kent State Truth Tribunal held three gatherings to record, preserve and honor the personal narratives of original witnesses and participants of the Kent State Massacre, May 4, 1970. Learning the truth at Kent State where four unarmed students were killed and nine were wounded as they protested the Vietnam war. The Kent State Truth Tribunal launched at the 40th anniversary of the Kent State shootings on May 1-4, 2010, followed by a KSTT in San Francisco and a final tribunal in New York City. We invited all concerned citizens, all participants of the original event — protesting students, Ohio National Guardsmen, Ohio and federal government officials, Kent State administrators and educators, local residents — everyone present that day, all those damaged by the killings in May 1970 and persons meaningfully involved in the prelude and aftermath of the 1970 Kent State shootings. Co-founded by Laurel Krause and Emily Kunstler, the Kent State Truth Tribunal filmed close to 100 personal narratives of the original participants and witnesses of the May 4th shootings. More on the KSTT Team. Laurel Krause and her mother, Doris Krause, seek and support the creation of the Kent State Truth Tribunal, focused on a single goal, to uncover the truth in the events leading to the killing of four students and the wounding of nine at the Kent State Massacre that occurred on May 4, 1970. We call all those affected by the Kent State Massacre to come forth and be heard! The Kent State Truth Tribunal invites your participation, support and tax-deductible, charitable donations. If the Truth at 1970 Kent State is important to you, please join us here. Let’s begin to uncover the truth about the 1970 Kent State Massacre in time for — and culminate during — the Kent State 40th memorial event on May 1-4, 2010. Over the first four days in May 2010, we invite all concerned citizens, all participants of the original event (protesting students, Ohio National Guardsmen, Ohio and federal government officials, Kent State administrators and educators, local residents — everyone present that day) and all those damaged by the killings in May 1970 to travel to Kent, Ohio and participate. We will share, recount and document via multimedia as we uncover, correct and rectify what has been falsely reported, known and documented about the Kent State Massacre to reach accord and healing in revealing the truth together. My sister, Allison Krause, was shot and killed at Kent State University in Ohio on May 4, 1970 as she protested against the Vietnam war. I dedicate the tribunal to Allison and my father Arthur S. Krause. 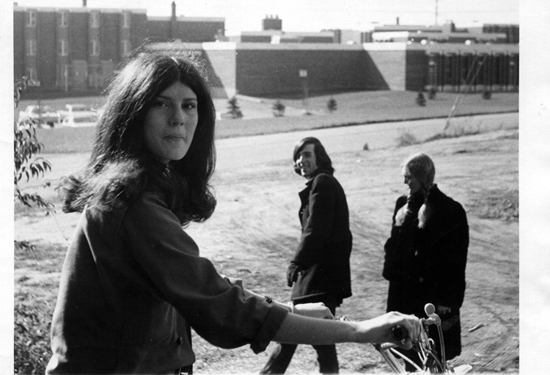 The family of Allison Krause seeks and supports the creation of a collaborative, multimedia, sharing event to dialog, document, discover and uncover the truth in the events leading to the killing of four students and the wounding of nine at the Kent State Massacre occurring on May 4, 1970. As the 40th anniversary May 4, 2010 swiftly approaches, we gear up to utilize every effort in creating Four Days in May, the Kent State Truth Tribunal. Let’s begin creating Four Days in May, the Kent State Truth Tribunal. We ask you to travel to Kent, Ohio and participate over the first four days of May. We are creating a new process to uncover historical/social/political truths and enable real-time documenting, multimedia publishing and consensus-building. Basically, every one involved shares their story to create and develop an accord, possibly reach consensus. We will study, share, correct and heal the gaping wounds obscured by the politics, lies and concealment of the past. We will uncover and dispel the past’s obscured falsities and incorrect theories thereby righting this deep wrong. We will explore what led to the genocide that occurred in the Kent State Massacre. We will come together in public participation, social media, art, the Internet and music to rectify these mistruths and wrongs as we correct history. We will create a new understanding of what IS known about Kent State. We believe that the time is right for us to begin NOW! We invite you to join us and let us know your thoughts! We know that only with your help, spirit and participation shall the truth emerge and this tribunal be true. Triggers were not pulled accidentally at the Kent State Massacre 40 yrs ago. Let’s begin to uncover the truth now! I am asking each of you to join me and my family, the Krause family, in calling for this important mandate to finally uncover the truth by creating and enabling Four Days in May, the Kent State Truth Tribunal. In early May 2010, we will see 40 years of concealment, lies and politics uncovered, erased and corrected. It will bring a tremendous healing for all those concerned and America! It has been too many years with the Kent State Massacre of 1970 seen as an American ‘accident, goof’ with everyone associated silenced and shunned. For all witnesses, participants and those damaged by Kent State, it has been too many years of KNOWING the truth was totally different than what was documented in history and perpetuated. The inability for all concerned and responsible to claim their misdeeds – to admit misguided intentions and actions – propels this festering wound into our world today. Absolutely not a mere accident! The cover-up was put in place no more than five minutes after the guard fired their 67 shots in 13 seconds that horrible day. For what it’s worth, I sent a FedEx to Nixon around the time of the 20th anniversary. I asked if it was time to come clean. I asked who were the guys that Michener wrote about on the motorcycles who started the rioting and the ones who started the ROTC fire? Was it an inside job? Did Nixon use his imperial thinking to do what he considered best for the American public – over and above the law? That sort of thing. A week or so later I received the whole package back, opened, with the letter stuffed back into the envelope, no response, and my name – no doubt – added to an FBI file…. I remember my father discussing Michener’s work on Kent State as pure fiction, created at Nixon’s request…they were colleagues. BTW, thank you for sending that package and having those questions. I hope you’ll join us to uncover the truth in the events leading to the killing of four students and wounding of nine at the Kent State Massacre. The fall after the massacre James Michener was in Kent and he came to a party at the house I lived in. I remember receiving money for beer and hamburgers for the party. I guess the beer helped people to be talkative. I wasn’t a beer drinker. I cooked the burgers. I remember reading his book and feeling betrayed, once again. It was crazy to trust that he would tell the truth. My dad Arthur Krause learned early on that ‘all responsible’ were not going to tell the truth. Here’s an interview showing his doubt in the system (video on the right here http://bit.ly/duZOd). We just found this treasure! Let’s make Four Days in May, the Kent State Truth Tribunal happen! I hope that you will join us for the Kent State Truth Tribunal on May 1-4, 2010 on the Kent State University campus in Ohio. You are invited to participate in Four Days in May, the Kent State Truth Tribunal. Please join us by traveling to Kent, Ohio and participating over the first four days of May 2010. 2. Let us come together in public participation, social media, art, the Internet and music to rectify the mistruths and wrongs as we correct history. 3. Only with your help, spirit and participation shall the truth emerge and this tribunal be effective in creating the healing we seek! As we are a grassroots organization forming RIGHT NOW, your participation is imperative. We also ask you to put on your thinking cap to help us create, organize, fund and successfully reveal the hidden truth of the Kent State Massacre in 2010! By revealing the truth of the Massacre at Kent you are participating in healing those surrounding the millions of innocent murdered victims by Governments around the world! Someone’s brother a mother a father a sister will feel the howl of truth!!! Every time they get away with this crap there is permission for another water boarding a beating in a ghetto CIA abduction bombs on innocent families and turning of a cold shoulder to genocide! Friends its all connected you can not separate any of it! My name is David Watson. I am a VietNam veteran. I volunteered to join the service before the draft. I volunteered to go to VietNam……….I love my country …….I love the people of this country. I am ashamed of the way the people with the power have hurt so many people worldwide. I am deeply ashamed of my country for killing your sister and the others that day and days that have followed these last 40 years…..Those were some very confusing times to say the least. Confusion is No excuse for the breakdown of civilized actions. The Kent State Truth Tribunal project you are undetaking is outstanding and if those with information, evidence, and testimonies that were either solicited or sought after in the federal investigation(s) will no doubt free up the devastating concealments and obstruction of justice that took place nearly 40 years ago. “Truth” does not run and hide – it is usually buried by those that are afraid of it. — However, rest assured that – does linger and never dies. I look forward to supply you with evidence, testimonies, photographs, and films that will stand up in the Congressional Judiciarry Committee and courts as well. This case is really why ther was a “Watergate”. Hope your facilities will be like Kiva in order to accommodate people and equipment to play VHS/DVD and offer dialogue. You can contact me by the private E-mail if you wish. In Nixon’s interview with David Frost, he said that “three” had died at Kent State. I always wondered about that. His actions following the shootings were so odd — his late night trip to the Lincoln Memorial and his meeting with the students gathering there for the protest that weekend. But something about his mis-remembering the number killed has always haunted me. Also, I agreed (as usual) with your dad about Michener’s book. I was told recently by someone who was interviewed by him that they lied to him because they didn’t expect him to tell the truth anyway. I tried to find his notes from that project because his papers are at the Univ. of Northern Colorado, near me. Amazingly, I was told that he didn’t keep any. That alone is suspicious. In about 1979, he was in a town nearby to promote his book, Centennial. I took my copy of Kent State, with all my notations, including “LIE” written more than once, and went to see if I could get him to autograph it. Unfortunately, he quit signing books before I made it to the front of the line. I was hoping he’d see how (animatedly) annotated my copy was. BTW, I created my own index for Michener’s book since he apparently didn’t feel the need. If you’d like a copy of that index, just drop me a note. It does make it much easier to find the elusive pieces you might be looking for. but the article itself is much longer and more complex. I suppose it’s wrong to say this but Norman has not had a very easy life since May 4 and, frankly, I’m glad for that. Good day! I had planned on being in Kent on the 2nd-4th however I see no reason why I could not get into town on the 1st. Is there a schedule of events that I could print out? Information on the Kent State Truth Tribunal is still developing. Our vision is for all original witnesses and participants of the 1970 Kent State Massacre to join us to share their truth, have it recorded and documented as well as preserved and honored at our Truth Tribunal. Stay tuned as we form our group and launch! I graduated from Plainview JFK in 1969. I was a student at Suffolk Community College on Long Island when the Cambodia Incursion occurred. Our school was shuit down on 2 May, 1970 and cordoned off by the local police after the killings. I remember the funeral procession going through Plainview and the main street (Old Country Road) being blocked off. I also remember many older parents taunting us for showing our respect with slogans such as “They should have killed 44, watch your back, commies…etc. It was a shameful time for this country and I hope to God we never see a period like this ever again in our history. If we do, shame on us as a people who will once again elect genocidal monsters to political office. Nixon, you can rot in hell forever for you will never see those students looking down on you from heaven. Rest In Peace my fellow students and patriots. My father, Charles Rider, was a photo interpreter for a government contractor, ESL, Inc., in Sunnyvale, CA (the founder/CEO of the company is former Clinton Secretary of Defense William Perry). He was one of the first, if not the first person to work with a computerized photo scanner. Most of his work was to enhance images of overflight and satellite images of Iron Curtain countries. In the early ’70’s he got the assignment to determine, through photographic images, what happened at Kent State. The only thing he ever told me was that he determined which of the National Guardsmen shot first. He analyzed the photographs and determined the handgun that fired first by the hammer location. My dad passed away in 2006. Although we never met, my mother and father were good friends of your parents back in the day Pete and Patsy Pakler.